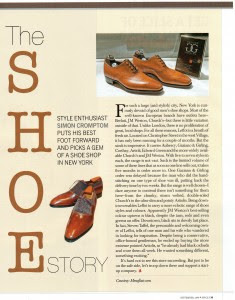 Indian luxury magazine Spice has published a Permanent Style article – the profile of New York store Leffot that appeared here on June 13. The full piece can be viewed on the Leffot blog here. You can follow the discussion on Permanent Style published in India by entering your email address in the box below. You will then receive an email every time a new comment is added. These will also contain a link to a page where you can stop the alerts, and remove all of your related data from the site. Congratulations! I can’t quite remember how I found your blog, but I’m sure glad I did, and I’m glad you’ve found a wider audience as well. Many thanks, both Easy and Arctic (if I may call you that). Your comments and questions on this blog are much appreciated. If either of you ever have any suggestions on the kind of information or posts you would find most useful, please tell me. Oh yes, and tell your friends! Thank you, I will give it some thought. I am adding you to my blogroll and recommending that my readers stop by.